Get all Christmassy with Peppa and her loveable friends in this special Christmas triple. Featuring Santa’s Grotto, Cold Winter Day and Peppa’s Christmas. 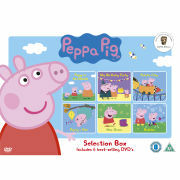 Peppa Pig Triple: The Christmas Collection is chock full of Peppa Pig episodes, both Christmas ones and normal episodes. It had my little sister laughing for hours. I would definitely recommend it.